It’s April Fools’ today, and the joke is brought to you by the United Nations University. In 2017, that institution published a research report that says the UN has a “key role to play in ensuring ethical reporting” by journalists. It complains there are too few regulations about how journalists portray migrants and migration, and insists adequate monitoring of media coverage isn’t taking place. This is a disturbing document from many perspectives, one of which is that no one at HQ apparently bothered to proof read it. It’s a mess from beginning to end, with numerous grammatical errors and typos everywhere. migrants are especially prone to acts of hatred and intolerance. That’s not what the report means to say. But that’s what it does, indeed, proclaim. Last December 13th, I asked the UN University via its website if a draft version had been uploaded by mistake. Was another version of the report available? I received no response, and the copy currently being distributed on the report’s official web page appears to be identical. It still says migrants are hateful and intolerant. That’s quite a statement, given that the UN has been waging a years-long campaign to quash ‘hate speech’ against migrants. 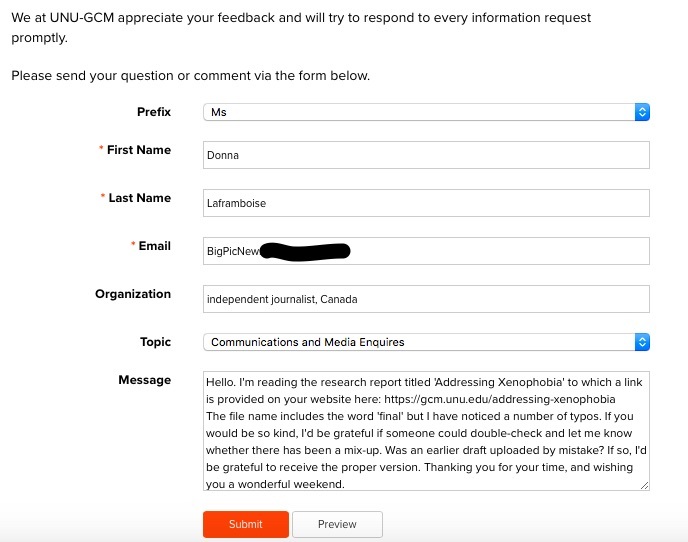 This entry was posted on April 1, 2019 by Donna Laframboise in free speech, media and tagged free speech, immigration, intellectual freedom, media, United Nations, United Nations University.